PS4 Firmware v2.50 is now available to download, and we have the official changelog right here. Along with the announced changes and features in the firmware, there are a few other features present in the changelog, including a new “Discover” feature and video controls using the DualShock 4 touchpad. The system can now enter rest mode without closing any applications. You can adjust this setting in [Power Save Settings] > [Set Functions Available in Rest Mode]. You can now back up data stored on a PS4 system to a USB mass storage device and also restore backup data. You can adjust this setting in (Settings) > [Back Up and Restore]. [Accessibility] has been added to (Settings). You can adjust accessibility settings such as zooming and button assignments. You can now upload video clips to Dailymotion™. PS4 system software can now be installed automatically. You can adjust this setting in (Settings) > [System] > [Automatic Downloads and Uploads]. You can now delete trophies with 0% achievement progress. [Earned Date], [Not Earned] and [Grade] have been added as sorting options for trophies. You can also sort by [Earned Date] and [Not Earned] options when comparing trophies with other players. You can now search the Internet for details about trophies from the options menu in [Trophies]. Screenshots of scenes when you earn trophies are now saved automatically. You can view saved screenshots in (Capture Gallery). You can now share trophy details and screenshots. Select the trophy you want to share details about in [Trophy] and then press the SHARE button. You can now test the host’s connection speed when starting Share Play. You can now enjoy Share Play at 60 fps. A host in a party can adjust the setting in [Party Settings] > [Video Quality for Share Play] > [Frame Rate]. Users who are your Facebook friends can now be displayed in [Players You May Know]. You can now send real-name requests in addition to Friend requests to users who are currently not on your Friends list. You can now apply a shadow style for text in [Themes]. You can now enter up to 140 characters for your self-introduction. You can now use the touch pad to operate playback of videos on discs. You can now upgrade a sub account to a master account. 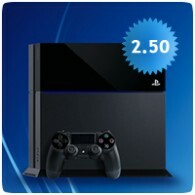 [Discover] has been added to introduce users to PS4 system features. You can view information about features in [Notifications] > [Discover].